In celebration of Fortnite’s first birthday, Epic Games has created a 3 challenge event to gift you with some sweet rewards. The most difficult of these 3 challenges is the Dancing Cake Challenge. Players must locate the 10 Fortnite Birthday cake locations hidden on the map and then dance in front of them. Players all over have been running around trying to find these hidden Fortnite cakes, with many users flocking to the web looking for assistance. ‘Cake locations Fortnite’ and ‘All cake locations Fornite’ searches have skyrocketed. 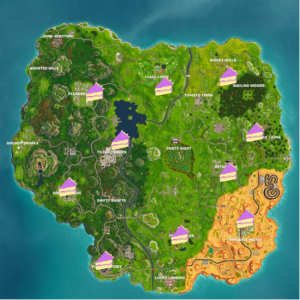 So, if you’re having trouble finding the Fortnite bday cake locations, you aren’t alone! They can be quite a challenge to find. Not to mention this is a limited time event. Fortunately, we’ve mapped everything out for you in this quick and easy guide. 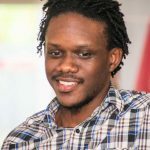 What you will learn in this article? 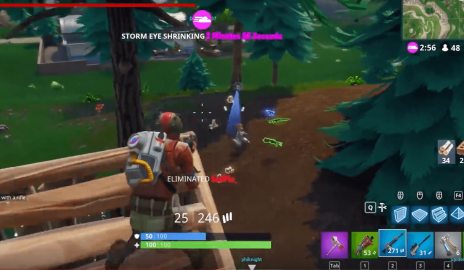 Before you read the whole blog post, did you know, that you can play Fortnite in the cloud on your computer or Android and continue your gameplay on another device, right where you stopped? For example, imagine that you started your game on the computer. Then you had to leave your flat. You would like to continue playing on your phone! play Fortnite in the cloud (play now). Before you start reading about Fortnite birthday cakes, learn the most important tips on how to get better at Fortnite (read now). 1. What do the Fortnite cakes look like? The giant cakes sprinkled around the map can be difficult to locate. But if you run into one … you won’t miss it. Multi-layered and sitting on top of a table – you’ll know when you’ve found a Fortnite bday cake. Scattered around the giant cake will be smaller pieces of cake, which you can consume for 5 health and 5 shield. Also leading up to the cake will be balloons pinned to trees and lampposts, hinting that you’re on the right track and cake is in your sights. 2. I found one… now what? Once you’ve finally found one of the Fortnite birthday cake locations you’ll need to use an emote in front of it. TIP: You can visit the locker in between games to double check that you have an emote equipped. It doesn’t really matter which one you use, just make sure you have an emote to use in front of the cakes! The default emote button for console is Down on the D-Pad or if you prefer playing on PC and other devices, just press the B key. Once you get close enough to the dancing cake, hit that emote! You’ll receive a notification that the challenge is complete if the dance was successful, and the progress will be added to your total. Just be careful when you’re running out to dance in front of a cake. Other players are still trying to win the game! Poorly worded puns aside, now is the time to get serious. You know what you’re looking for, you know what to do once you’ve found it. 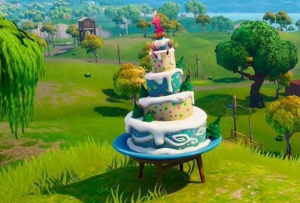 Now, where are all the birthday cakes in Fortnite? The cake is located on the eastern side of the town. If you see basketball courts and other houses, that’s your sign that it’s close. Find the giant cake sitting on a table, run up to it and DANCE BABY, DANCE! This is one of the easier ones to find. The cake is located to the right of the main road running through Greasy Grove, near the northern entrance to the area. Once you get there look around for the cake, and then… stop when you find it. Located almost right in the middle of the area, this one’s pretty hard to miss. Just follow the balloons and run toward the center of Fatal Fields. When there’s a giant cake in your face stop running and dance! If you’re at Loot Lake, head toward the south where the river enters the lake. From there just walk west along the shore and you should have no problem finding it. Who doesn’t love long walks on the beach? The northernmost cake on the map, this one is located slightly off the road running south of Lazy Links. Near the golf courses in the area, go to the sandpits and you’ll see a cake nearby. Just don’t get stuck in the sand trap! This is one of the more challenging cakes to find. But that’s why you’re reading this guide! Once you get to Risky Reels head southeast until you get near the edge of Wailing Woods. Located atop the hill between the two areas, run up and do a dance to unlock the progress on for the Risky Reels cake. Not far from the Risky Reels Fortnite bday cake, head to the western edge of Lonely Lodge. Near the parked cars you’ll find a hill overlooking them and the road. On top will be a cake. You know what to do – dance. Next head to the newest addition to the map: Paradise Palms. If you’re coming from the north head straight to the entrance to the town. Slightly off the road to the east at the northern entrance, you’ll see the cake on a small stool. If you see the giant welcome sign to the city that’s your sign it’s close by. For this one head over to Pleasant Park. Search the east side of the town for the gas station. Once there, continue further east slightly outside the town and you’ll spot the cake for this area. Congrats, you found all the Fortnite cake locations! Now here’s what you’ve won. Once you’ve found all the Fortnite bday cake locations and did a dance with ‘em, you’ll unlock the reward. Completing this challenge will award you with the Happy Birthday! Spray. But the party doesn’t have to stop there. That’s only one of three challenges (although arguably the most difficult). Playing 14 matches during the event will award you with 5,000xp. Not too bad. Deal 1000 damage to opponents and you’ll unlock the Fortnite Birthday! Emoticon. Do all 3, and you’ll unlock the limited time Birthday Cake back bling. Not bad rewards for some simple challenges celebrating the 1 year anniversary of the game. Like most limited time rewards these most likely won’t be making a return to the game, so get them done while you still can. This event is running from July 24th to August 7th, so you should have plenty of time to complete it. Make sure you have an emote equipped before the match begins. Visit your locker in between games to equip one. Once you start the game, check out the map and pick a Fortnite cake to start with. Run towards the cake, keeping an eye out for balloons to signal that you’re close. Once you’ve found one, get close to it and dance! Start at one cake and then move on the nearest cake location once completed. Dance in front of all 10 cakes and then you’ll unlock the Happy Birthday! Spray! 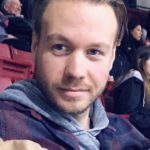 Do you experience lag problems when trying to collect all Fortnite birthday cakes? In this full guide, you will discover all causes and solutions to Fortnite lag! (Read now). You can also avoid lots of lag problems if your game will be handled on the powerful servers instead of your gear. 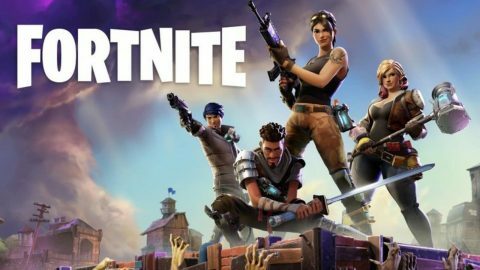 Play Fortnite in the cloud and avoid lag issues! Epic Games has created a fun and engaging event for its players to earn some sweet (heh) rewards to celebrate its release 1 year ago. Rather than simply being awarded for logging on, this activity provides some challenge and thus a sense of reward when finished. It’s not likely you’ll complete all 10 cakes in one match, especially depending on where the storm goes, so don’t worry if it takes a couple of games. Other than that, remember to have fun with this. It’s still a game after all! Did you like this event and reward? Or do you think Epic Games should’ve done something else for the first anniversary of this insanely successful game? Let me know in the comments below. 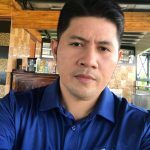 Like what you read? Please rate! Connoisseur of dad jokes and lame puns. I write to teach you something and hope that its entertaining enough you don't notice you're learning. If I'm not working or playing, I'm probably in the kitchen or at the gym. 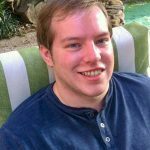 Fortnite System Requirements: Can my PC (or Mac) run Fortnite? available only for our subscribers? © 2017-2018 RemoteMyApp Sp. z o. o. Made with mad skills and bare hands in Szczecin, Poland, Earth (third rock from the yellow big one).